Yoga is a great activity for stress reduction, flexibility, strength, and much more, plus it’s low impact, which makes it suitable for a wide variety of people. However, while yoga is a great many things, it is still possible to wind up up with an injury if you are incorrectly repeating poses week in and week out. Learning and using proper technique is key to keeping yourself pain-free and reaping the most benefit from a yoga practice. With that in mind, today we are looking at 5 types of pain that can arise from practicing yoga and simple ways to prevent pain in the future. 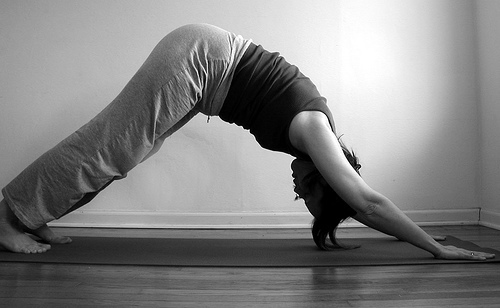 This post will look mostly at beginner poses that are integral to most yoga classes. It is a little text heavy, but it is important information if you are suffering from any pain from your yoga practice! 1. Shoulder Pain. Downward Dog and Chaturanga are often to blame here. Take a look at the picture at the very top of this blog as well as the small image on the far right just above. Let’s start with downward dog. When your arms are not strong enough to properly hold downward dog or if you are pushing your shoulders back trying to achieve a certain “look” for your downward dog, it compromises your shoulders. When you sag in the shoulders, instead of using your arm muscles to hold you up, your shoulders are put under incredible pressure. Similarly, in chaturanga, if your arms are not at a 90 degree angle and your shoulders are dropping below your elbows in the final pose, you are again putting too much pressure on the shoulders and will likely feel sore. Again, this improper form can come from weak arm muscles, as well as weak core muscles. What can you do? In downward dog, do not push your shoulders back to achieve the shape of the pose, instead, press firmly into your hands and lift your hips towards the ceiling, keeping the knees bent. When your arms begin to feel tired and your form is compromised, drop the knees and rest in child’s pose. It is better to slowly build your strength and use proper technique instead of working through pain and injuring yourself. For chaturanga, before you come into the pose, shift your weight forward on your toes to insure that your arms bend into a 90 degree angle as you lower your body halfway to the floor. As you near this 90 degree angle, do not let your shoulders drop lower. It can be useful to practice in front of a mirror to see what 90 degrees feels and looks like. If you are still building arm strength, it might be difficult to lower yourself with enough control to maintain the right angle, sometimes the hips even lift to compensate, which puts more pressure on the shoulders. To build arm strength, try performing the pose from your knees. 2. Neck Pain. Shoulderstand and headstand are often the poses to look out for if you are noticing neck pain. As a teacher, I do not instruct either of these poses because I think that they place too much unnecessary pressure on the neck. What can you do? if you are dedicated to keeping these poses in your practice, please make sure that for headstand, you have sufficient strength in your arms to keep the majority of your weight from falling into the neck. This means that you can easily hold dolphin pose or chaturanga with proper form. For shoulderstand, please make sure your teacher instructs you to place the shoulders on a stack of blankets or folded mats to create a less severe angle between the torso and the neck and to take some pressure off of the back of the neck. If you are practicing these inversions and experiencing neck pain, please stop until the pain goes away and then decide for yourself if you would like to continue incorporating them into your practice. Some alternative inversions to try are handstand and forearm stand — these inversions do not place pressure on the neck but still require a lot of arm strength so build up to them. 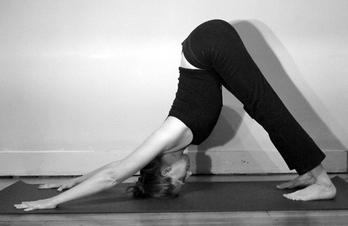 Downward dog and a simple forward fold are also inversions! Legs up the wall or Viparita Karani is also a safer alternative to feel weightless in the legs. 3. Wrist pain. Take a look at your downward dog and plank. These poses especially require you to use the strength of your whole hand — your fingertips, finger mounds and palm. Often, when we are not used to using these muscles, the weight of the body just falls straight down into the wrists and not surprisingly can start to make your wrists sore. What can you do? To begin with, don’t hold these poses for longer than you are comfortably able. When the hand and arm muscles are tired, often we end up letting the weight drop into the wrists. Second, work on building the strength of the shoulders and hands by spreading your fingers wide and pressing into the whole hand, fingertips and all as you engage your arm muscles to keep your body lifted. If you can easily lift a finger while in the pose, you are not using your whole hand to support you, so start pressing those fingers! 4. Elbow Pain. This sort of pain can be the result of poor technique in chaturanga for the same reasons we mentioned earlier. When the arms are not at a 90 degree angle, not only is there excess pressure on the shoulder, but there can also be excess pressure on the elbow. What can you do? The same advice applies here, if your arm or core muscles are weak, build up to the pose, by practicing on your knees. Also, make sure to shift your weight forward and do not lower the torso or the shoulders beyond halfway to maintain a 90 degree angle in the arms. 5. Lower Back Pain. Look out for rounding of the back in forward folding poses, such as a standing forward fold or a seated forward fold. Rounding of the back can happen in downward dog as well. If those aren’t the culprit, it could be sagging hips in plank pose or even the result of performing too many poses on one side of the body all at once. What can you do? If your back rounds in downward dog (check in a mirror), take your feet a bit wider apart and bend the knees so that you can more comfortable lengthen out the back. Likewise, in forward folding poses, bend the knees and take the feet wider apart (hip-distance or so), then only fold forward as far as you can while keeping the spine long and extended, not hunched over. For plank pose, if the hips tend to sag towards the ground, it likely means that you do not have the arm or core strength yet to hold the pose properly and you should probably build your strength by performing the pose from your knees with your torso in a straight line. Once you feel stronger, try the pose again from the toes and keep the hips lifted so that the entire body is in a straight line, not curving up or down. Finally, try to avoid completing more than 3 asymmetrical poses in a row (i.e. Poses like triangle, extended side angle, warrior I or II, etc) . Before continuing on, come back to center and let the spine and hips even out again with a child’s pose, downward dog, chair pose, or any other symmetrical pose.